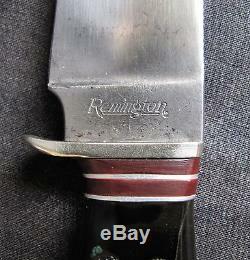 Vintage Remington hunting knife with a 3.5 blade, 8.75 overall. 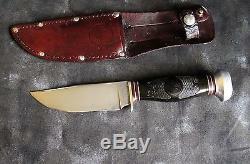 Knife tang and handle are marked Remington. 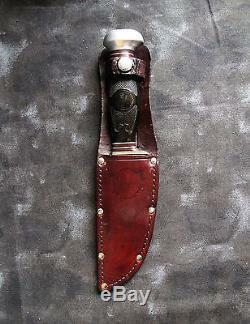 Hard black handle with spacers and aluminum guard and pommel. 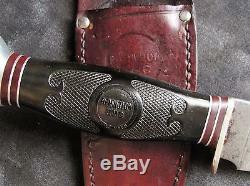 In original Remington marked left side leather belt sheath. 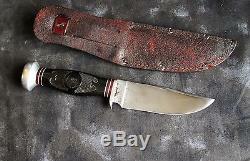 Knife is in very good overall condition, carried and lightly used. Blade is straight, tight and very sharp. 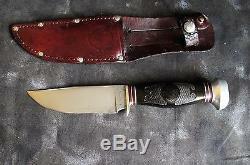 Sheath is in fair condition, shows age. Made in USA, circa 1930's. We include all the information we have about this item and if its not shown in the photos, then its not included. 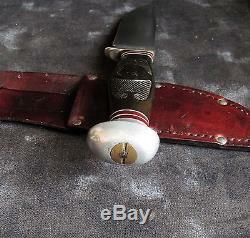 The item "Remington Hunting Knife withSheath, 1930s USA" is in sale since Tuesday, February 23, 2016. 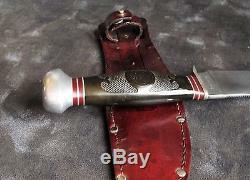 This item is in the category "Collectibles\Knives, Swords & Blades\Fixed Blade Knives\Vintage (Pre-1970)\Factory Manufactured".
" and is located in Denver, Colorado. This item can be shipped worldwide.